I WAS FLIPPING through channels last night and came upon REO Speedwagon singing a song. Joining them was a "singer," and I'm being polite. I have no idea who he is. I will call him Bald Guy. Bald Guy was in a leather jacket and was jumping up and down and basically just repeating every phrase sung by by Kevin Cronin of REO. Apparently Bald Guy is named after a dog. Ruff, ruff. I watched, horrified, for about 30 seconds. And you know what the best part about TV is? No Bald Guys named after dogs on this album. The problem is the image is burned in my head, and I can't get it out. Sheryl and I are taking a break this weekend and I will need the therapy, that's for sure. 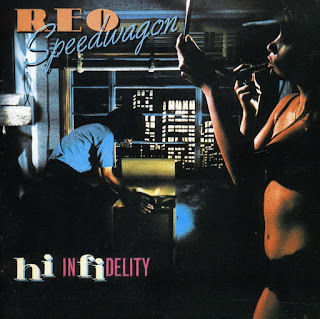 I love REO Speedwagon. They have great songs. They are soundtracks to my youth. I sing and play their songs. They rock. I might pay $30 at a state fair to see them, really. There's nothing wrong with cross-pollinating, either. You can have a rap and rock guy play together, or a country and folk guy/gal. Whatever. Music knows no boundaries and it's fun no matter what style you play. I guess you can't blame REO Speedwagon. They have to make a living, too. "Hi. I'm Joe Blow from The Network. We are doing a show about the 1980s. We want you to play with a current artist who can't sing or play any instrument, uses autotune and looks tough, so people love him We will pay you five quadrillion dollars. You in?" Of course you are in. Unfortunately, the next time I hear an REO song, I will think of Bald Guy. Maybe my weekend therapy will help erase the image.